We took a bucket list trip to celebrate my chapter 2’s 40th birthday – a milestone that my husband, Steve, did not get to experience. I expected to see some Inkan ruins and learn a little about the Inka culture. What actually happened was an experience in life lessons weaved throughout the history and culture of Peru. Most people will not have the chance to visit Peru in their lifetime, so I wanted to share the top 10 things I learned about life on this trip. 1. Explore the world around you. I love to travel. Love it. Peru was never a place I thought I would go, but I am so glad I did! Machu Picchu exists today (as well as most of the world) because people were not afraid to step away from their comfort zone. They were willing to not only take the road less travelled, they created the road. By doing this, they created a history worth remembering. Create the opportunity to learn about the journey of others – seek it out – you will be surprised what you can learn. When was the last time you walked somewhere new in your town? We walked an unbelievable amount and by walking we discovered delicious places to eat, neat souvenirs, participated in the local market, and saw incredible Inkan ruins. In Peru, everyone walks – children as young as two can walk longer distances than many American adults. Peruvian adults with children carry them on their backs using a blanket tied around them. People young and old carry items from the market or field to their homes – heavy stuff! The human body is amazing. I am thankful to have a choice whether to walk or not, and just how much I am willing to carry at a time. I’m committed to walking and exploring my new hometown as a family this summer. One of the most profound messages I heard from our tour guide was said in passing. 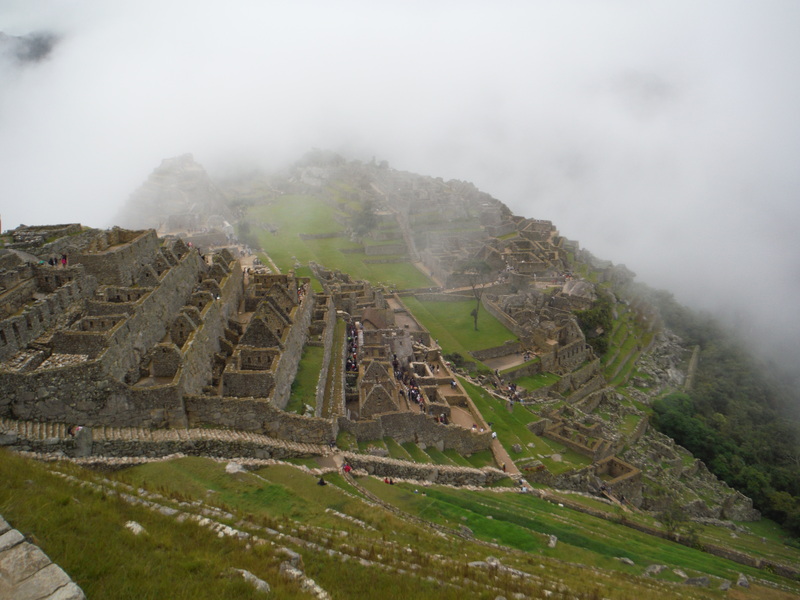 In Peru, the Spaniards came and destroyed many Inka structures in an attempt to bring Christianity (Catholicism) to the people. Many Peruvians today practice both Inka traditions and catholic traditions (including our guides). When asked about the blending of cultures, our guide stated, “when you find God in your heart, it does not matter how you worship him. When you truly find God, you will have peace and love in your heart and you will live your beliefs.” The Inka Gods are different than the Christian Gods, but they do not compete in the hearts of Peruvians. I am a Christian that has struggled to find a church “home” and this perspective was a great reminder that it is much more important to live your life as a reflection of your beliefs than it is to focus on what you need to do to fit a certain mold. Many people question God when they lose a loved one – believe me, I did! What I quickly realized was that in order to see Steve again I had to believe. If I didn’t believe in Him, then there was no chance of seeing Steve again. I also continue to receive signs that he is around me – these signs have solidified my faith that Steve is always with me. He continues to give me strength and guidance on how to live my life post-loss. The Inka culture uses Shamans (healers) to help them give thanks for what they have in their life. The culture recognizes that everyone has challenges and struggles in life, but there are also many opportunities to give thanks. When a new house or building is constructed, the construction company must have a Shaman blessing with the family or owners before it can be used. If a family purchases a car, they should also have a Shaman blessing for their good fortune. The Inka culture requires a form of meditation (taking the time to reflect) when blessings occur in your life. This could be a house, a child, a job, a new animal or any number of things. We were able to participate in a Shaman healing ceremony during our trip. The blessing includes gifts to the Gods (these are very small items, but tokens that represent significant beliefs in their culture), but the most profound thing was the 3 coca leaves that each individual receives from the Shaman. There is a leaf that represents a prayer or blessing for oneself, a leaf that requires a prayer or blessing for someone you love, and a leaf that represents a prayer for the pacha mama (mother Earth – this could be something as simple as rain for the crops, clean water, or could be as complex as peace in the world). You breathe life into these prayers by giving a breath over each leaf as they are given back to the Shaman. Take the time to give thanks for the blessings in your life. When I was at the depths of my grief, the one thing that could bring me out of my black hole was finding something to be thankful for. This takes practice, but practice becomes habit. I plan to focus on developing this more with my daughters. I already ask them “what was your favorite part of today?”, but I have added, “What is one thing you are thankful for today?”. This has led to some adorable dinner discussions! In Peru, the expectation is that every person provides value. They have an unemployment rate around 28%, and yet I only had one person ask me for money. One. When was the last time you walked around a US city and only saw one person begging? We have millions of people that plan their lives around government assistance in the US – it is not the same in Peru. Peruvians expect that even those with nothing will add value. These individuals can sell small trinkets and Peruvians will pay more than necessary to help the family. People shine shoes for 1 sol (about $0.32), they wash windows, they knit, they clean. The point is that they must sell or provide some value to the person that is spending the money. Anything less is considered laziness and is seen as disgraceful in their society – they will not contribute to that behavior. This is one trend I wish America would learn. Life isn’t about handouts. It isn’t about what is fair. Life is what you make it. Everyone has setbacks, challenges, and losses. Some hide it more than others, but we all have struggles. What we do with our time on Earth is what matters. Focus on what you can do in this life to add value to your family and your community. This may be in the form of time, talent, or treasure, but please, please, add value! You are here to make a difference, you are here for a reason – don’t waste it! 6. Help your neighbors and friends. In Peru, if a person needs help (like a new roof on their house) they will bring bread and some beer (the amount is based on the size of the request) to their friends and family to ask for help with the project. By accepting the bread, the individual commits to providing assistance. Neighbors, friends, and families work together in the fields, in markets, and in their homes. These practices made me realize that I need to put more effort in to developing these relationships in my new town and be willing to help and be helped when needed. When Steve died a group of our co-workers (both Grotberg Electric and John Deere) came out to my house to help me finish our barn, repair the horse arena, and help me winterize my house. Their presence meant so much to me as it reminded me of how much Steve was loved by so many, and it lifted a burden off of my shoulders. Jon and I are planning to pursue opportunities to devote time to local charities along with our children in the Quad Cities. We want to teach them to contribute to the community by being good examples ourselves. Stay tuned – there may be some posts about these adventures! I was amazed at the children of Peru. They are beautiful souls that work hard alongside their parents and relatives. Our guides explained that everyone is expected to contribute (see #5) and it is the parent’s duty to teach children how to work, farm, sell, and buy items. If a parent raises a child that does not contribute, the child is deemed lazy, and the parents are to blame. We saw children with alpacas on leashes (running around town laughing!) or carrying lambs to allow tourists to take pictures with them for money. We saw 2 and 3 year olds working with their families all day at the markets (and they were very well behaved). We met a 9 and an 11 year old that cleaned the graves at the cemetery for money for their families. I was able to give the children in the cemetary bread as a gift for their families and it was truly humbling to think that bread means so much to them. Children, especially those from the poorer families, must contribute to the overall success of the family. This in turn teaches the children how to work and survive in the real world. At 5 they know how to safely cross streets alone. They can find their way home. They learn the value of money. My take away from this is that my children are capable of much more than I ask of them. I need to teach them to contribute to the family more and give them a sense of pride in doing so. They are not too young at ages 4 and 6 – I just need to give up the idea of perfection, and be thankful for the contribution. The trip to the cemetery in Peru was hard for me. I missed Steve. At 29, I saw my own headstone – the place that someday will be one of my final resting places. I worked my way through the grief and sadness the best I could in that moment. I was reminded that my love for Steve is reflected in the way I live my life, how I raise our daughters, and how I remember him every single day. He is with me no matter where in the world I am, and he is always in my heart. I visit Steve in a different way, but just like Peruvians, I take the time to remember and that is the important part. We happened to be in Cusco, Peru for the final day of Carnival. And, wow, what an experience! There are parades and music, dancing, laughter, and fun. Carnival involves people spraying each other with squirt guns, throwing buckets of water on people, covering each other in silly string, and even some shaving cream. There are drive by squirtings…I have never seen so many people having so much fun – adults, children, tourists, and locals. I will say as a tourist *most* of the locals did not try to “get” us. However, it didn’t take long on our walk to get covered in shaving cream, have a water balloon popped by my head and all over me, and get squirted with a water gun. And I laughed, giggled, and just took it all in. What a pleasure to be a part of an event where people genuinely have fun together no matter who you are! It was a great sense of community and it was so humbling to see the people of all societal levels enjoy the camaraderie of each other. Carnival was one of my favorite memories on this trip. 10. Do the unexpected for others. This trip was humbling in many ways. Our tour guides did so many little things that made a huge difference in our experience, but there are two specific stories I would like to share. We opted to have a traditional Peruvian supper at the home of a local Peruvian family one night. During the dinner, the question was asked about why we made the trip, and we replied that we came to celebrate a birthday. Raul (one of the tour guides) immediately leaned over to me and asked how to spell Jon’s name. He wrote it down, finished his food quickly, and got up from the table. This was not unusual as he was translating for the host family and us due to the language barrier. Between the main course and the end of dessert, he was able to find a cake, get it personalized, get candles, and communicate with the host family what was going on. How he found one at 8:30pm I will never know! The host family sang the Peruvian version of happy birthday and we sang happy birthday in English immediately afterward. Once the candles were blown out, Raul informed Jon that he had to bite the cake – like bite into the side of it before it could be cut! When he went to do that, Raul pushed his face into the side of the cake – and it was all caught on film. Jon got him back by kissing his cheek with his cake covered face. It was a celebration to remember and my absolute favorite memory of this trip! The second story was when we left at the airport. Raul pulled us aside and said he wanted to give the two of us a gift. He gave us each a necklace with the cross of life. He stated that he could feel that our hearts had been through a lot of pain (we did not share any part of either of our pasts with people on this trip), and stated that surviving that type of pain makes the heart stronger. He said that he could feel the love that we had for each other, and that a love like ours was a blessing that should be treasured. He gave us the cross of life to remember that when one part of life ends, another begins, and we have an opportunity to still live a great life. What amazing and profound words from someone that has only known us for a few days – someone that had no clue what either of us has gone through. There are times in life when you feel blessed, humbled, and thankful for the angels that walk this Earth. I believe Raul was sent to make a difference in our life, and give us a message focused on the strength and power that we have together. There are people that still don’t understand our journey, but that is OK. It isn’t their journey it is ours. My take-away from this is to look for opportunities to go out of my way for others. I also need to step out of my comfort zone more often and encourage others to live life to the fullest. The day I returned, I recieved an email from a widow looking for someone to talk to. Coincidence? I don’t think so. Peru was a beautiful country – I can’t even begin to describe it in words and the pictures do not do it justice. The country is safe, and the people are very nice. Our experience on a very quick 4 day trip was excellent, and I learned an incredible amount about the Inka culture, Peruvian people, and most importantly, I learned more about life. What are some lessons you have learned through traveling? What is the best place you have ever been, and why?